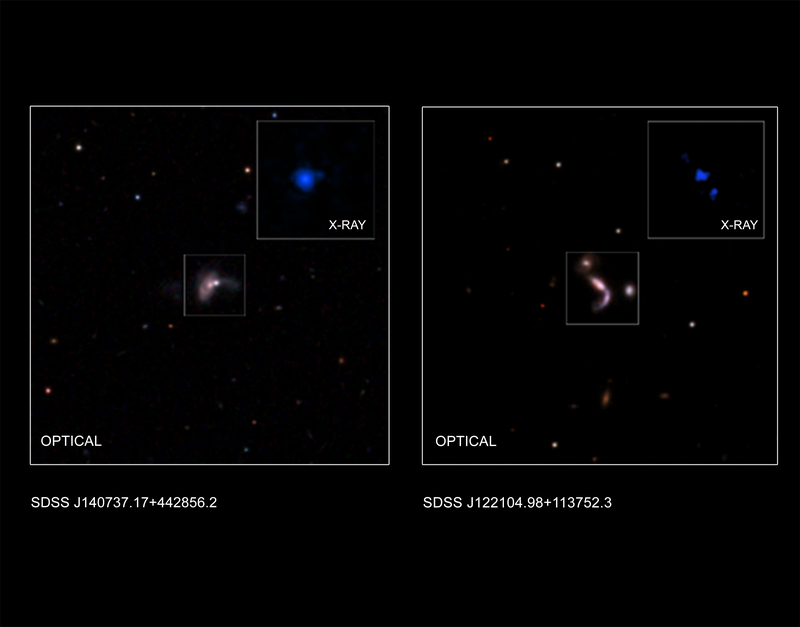 Five new pairs of merging supermassive black holes have been discovered by combining data from different telescopes. Models predict such growing dual supermassive black holes, but relatively few have been found. Researchers used Chandra observations to follow up on promising candidate mergers identified in optical and infrared studies. X-ray and infrared radiation is able to penetrate obscuring clouds of gas and dust that keep these black hole pairs otherwise hidden. 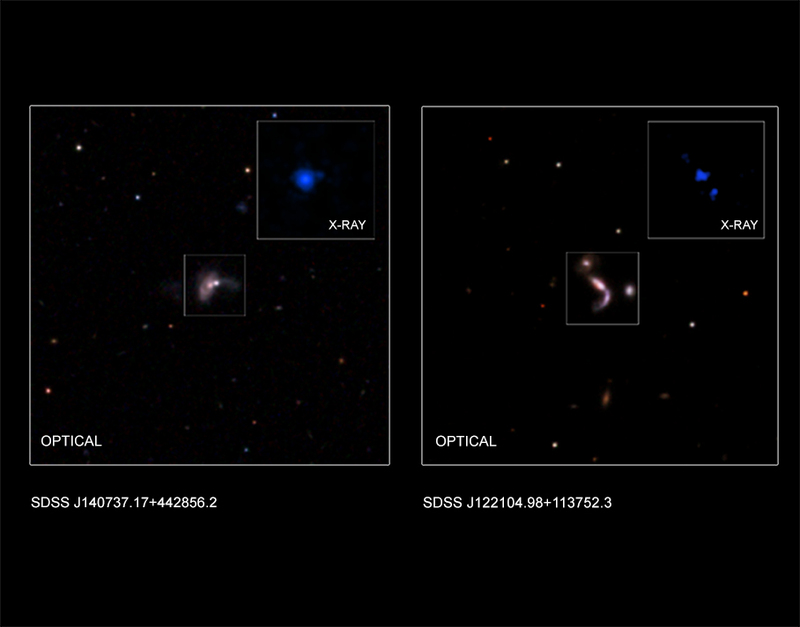 This graphic shows two of five new pairs of supermassive black holes recently identified by astronomers using a combination of data from NASA's Chandra X-ray Observatory, the Wide-Field Infrared Survey Explorer (WISE), the ground-based Large Binocular Telescope in Arizona, and the Sloan Digital Sky Survey (SDSS) Mapping Nearby Galaxies at APO (MaNGA) survey. This discovery could help astronomers better understand how giant black holes grow and how they may produce the strongest gravitational wave signals in the Universe, as described in our press release. Each pair contains two supermassive black holes weighing millions of times the mass of the Sun. These black hole couples formed when two galaxies collided and merged with each other, forcing their supermassive black holes close together. While theoretical models have predicted such giant growing black hole pairings should be relatively abundant, they have been difficult to find. 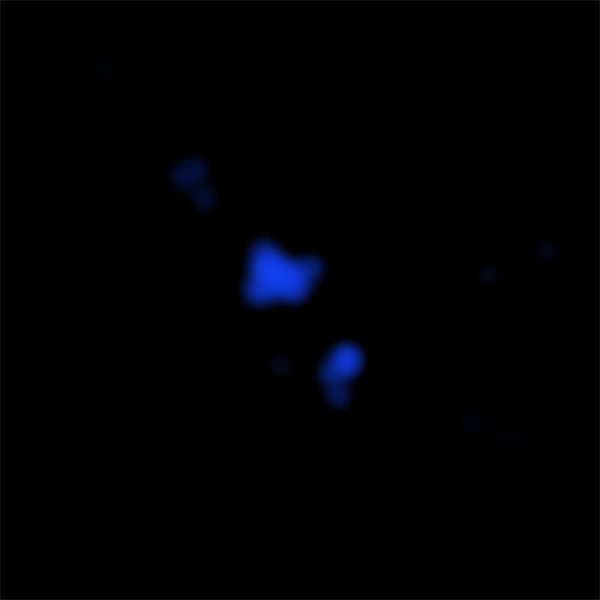 To uncover these latest supermassive black hole pairs, astronomers used optical data from the Sloan Digital Sky Survey (SDSS) — shown in the main panel of each image — to identify galaxies where it appeared that a merger between two smaller galaxies was underway. Next, they selected objects where the separation between the centers of the two galaxies in the SDSS data is less than 30,000 light years, and the infrared colors from WISE data match those predicted for a rapidly growing supermassive black hole. Seven merging systems containing at least one supermassive black hole were found with this technique. Because strong X-ray emission is a hallmark of growing supermassive black holes, the team then observed these systems with Chandra. 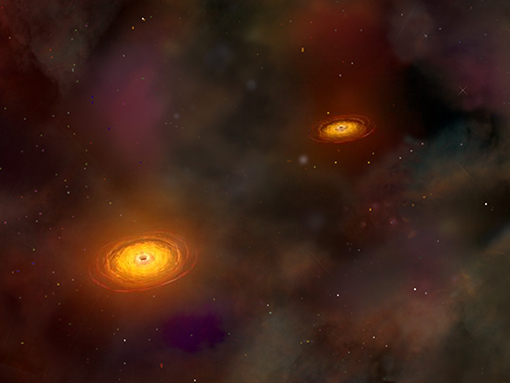 They found that five systems contained pairs of X-ray sources that were separated by a relatively small distance (see inset for two examples), providing compelling evidence that they contain two growing, or feeding, supermassive black holes. Both the X-ray data from Chandra and the infrared WISE observations suggest that the supermassive black holes are buried in large amounts of dust and gas. Because these two wavelengths are able to penetrate the obscuring clouds, this makes the combination of infrared selection with X-ray follow-up a very effective way to find these black hole pairs. Chandra's sharp vision is also critical as it is able to resolve each of the X-ray sources in the pairs. Four of the dual black hole candidates were reported in a paper by Satyapal et al. that was recently accepted for publication in The Astrophysical Journal, and appears online. The other dual black hole candidate was reported in a paper by Ellison et al., which was published in the September 2017 issue of the Monthly Notices of the Royal Astronomical Society and appears online. Coordinates (J2000) RA 14h 07m 37.17s | Dec 44° 28´ 56.2"
Scale Image is 3 arcmin (~760,000 light years) wide. Coordinates (J2000) RA 12h 21m 04.98s | Dec +11° 37´ 52.3"
This is a magnificent contribution of Chandra to modern astrophysics and to the precise understanding of the universe. Congratulations. Pairs of supermassive black holes. The distances vary with each pair. X-rays from Chandra X-ray Observatory and optical light from the Sloan Digital Sky Survey. The sizes vary with each pair. X-rays are blue. Optical light is red, green, and blue. These 2 pairs are located in the constellations Bootes & Virgo.